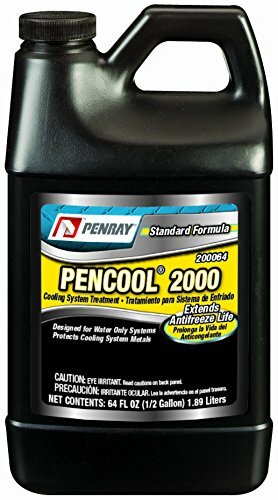 Save 1% on the Pencool 2000 200064 Engine Cooling System Treatment - 1/2-Gallon Jug by The Penray Companies at Beaver County Collision. MPN: 200064. Hurry! Limited time offer. Offer valid only while supplies last. Pencool 2000 200064 Engine Cooling System Treatment - 1/2-Gallon Jug is a unique liquid formula engineered to keep diesel engines running cleaner. Pencool 2000 200064 Engine Cooling System Treatment - 1/2-Gallon Jug is a unique liquid formula engineered to keep diesel engines running cleaner. This easy-to-use product reduces scaling and corrosion while acting as a lubricant in the cooling system. It controls the formation of harmful scale deposits, reduces metal corrosion, cavitation erosion, and lubricates the water pump and other metal surfaces. It eliminates messy filters, saving maintenance time costs. The Penray brand of products is engineered for use by professional automotive maintenance and repair technicians. Our superior product line helps to improve gas mileage, extend engine life and improve overall performance with the consumer in mind. Technicians rely on Penray Professional Service Kits for fuel injection cleaning, power steering flush, transmission flush and other maintenance services. Penray’s broad line covers fuel additives, oil additives, maintenance products, service items and winter products. For over 65 years Penray has manufactured quality chemical products with innovative chemistry focused on automotive, heavy duty and marine applications. Each of our products is specifically engineered to help keep your vehicle performing at it’s very best. If you have any questions about this product by The Penray Companies, contact us by completing and submitting the form below. If you are looking for a specif part number, please include it with your message.